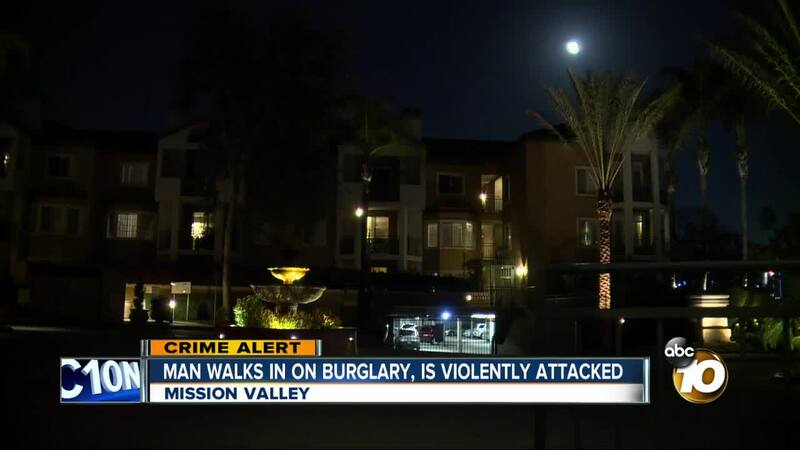 SAN DIEGO - A California resident said he was attacked after entering his home and finding two burglars inside. The victim said he walked into his apartment unit at around 10 p.m. on Oct. 19 and was immediately hit in the head with a baseball bat. “Since I didn’t fall down, he struck me a second time on the side of my head, and then, again, I didn’t fall down,” the victim said. While in the dark, the victim managed to pin the attacker down, but he didn’t realize a second man was inside armed with a handgun. “I could see that it was fully retracted, so it was slid all the way back. And at that point, he kept trying to discharge it, so he kept lunging like he was discharging it … the weapon never fired,” the victim said. The victim said he was then able to grab the bat again. “I immediately got up [and] I swung the bat to hit him just to give me enough time to get out the front door and then I ran out yelling for help,” he said. By the time police arrived, the two burglars were gone with two suitcases full of items. The victim was taken to the hospital with a concussion and a gash that required plenty of stitches. He said he feels lucky to be alive after the ordeal.